Basil Moreau discovered Our Lady of Sorrows by accident. 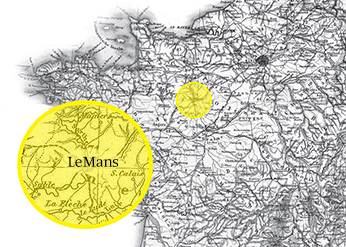 In 1836, Moreau and his companions found themselves homeless in the French city of LeMans. A man invited them to stay in his home, and the priest did not hesitate to accept the offer. The home was in a neighborhood called "Holy Cross". Not long after, Moreau received a gift of property in the neighborhood, and he made the property into a novitiate for his brothers. The name of the property was "Our Lady". It was all an accident. A confusing turn of events that caused the young group of priests and brothers to live in a place called "Our Lady of Holy Cross". But the connection was not lost on our Blessed Founder. Moreau, with his prototypical French devotion to the Heart of Mary, seized on this accident of Providence and made it foundational for his fledgling congregation. What began as a series of coincidences ended as the spiritual heart of an international religious order. Moreau did not seek out Our Lady of Sorrowsshe sought him. That's the way that Providence works. Beneath the complex web of everyday thoughts, emotions, and interactions, a glowing golden thread of grace intricately weaves throughout everything and connects it to God's Will. The actions of a desperate priest in 19th century France determined the spiritual life of thousands of his children almost 200 years later. My own devotion to Our Lady of Sorrows was just as much an accident of Providence as Moreau's. An offhand comment by a diocesan priest caused me to investigate this "Lady of Sorrows" as a 15-year-old, and before long I named her my Patron Saint. Nine years later, I find myself in a family who also loved her by accident; and together we celebrate her as our Patroness. 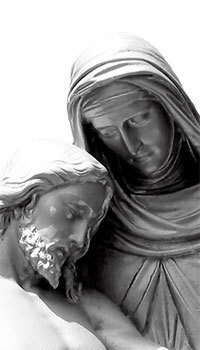 On that day, we recall these words from our Constitutions: "There stood by the cross of Jesus his mother Mary, who knew grief and was a Lady of Sorrows. 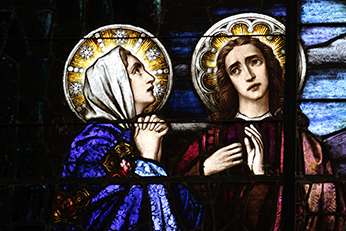 She is our special patroness, a woman who bore much she could not understand and who stood fast. To her many sons and daughters, whose devotions ought to bring them often to her side, she tells much of this daily cross and its daily hope." Our devotion to Our Lady of Sorrows is the result of Providence, an accident of extraordinary circumstances. Despite this (or rather, because of it), she is the very model for our lives. We share an intimacy with her that can only be the result of grace. God gave her to us as a gift, and so we reach out yet again and grasp her hand at the foot of the Cross. Mr. Josh Bathon, C.S.C., has just returned to Moreau Seminaryafter completing his novitiate in Cascade, CO. Josh entered the Old College Program in 2010, and graduated from Notre Dame in 2014 with an undergraduate degree in history and philosophy. He is from Greenville, South Carolina.